Top-ranked Rafael Nadal retired in the fifth set of his quarter-final match against Marin Cilic on Tuesday at the Australian Open, while Great Britain's Kyle Edmund upset No. 3-ranked Grigor Dimitrov to reach a Grand Slam semifinal for the first time. 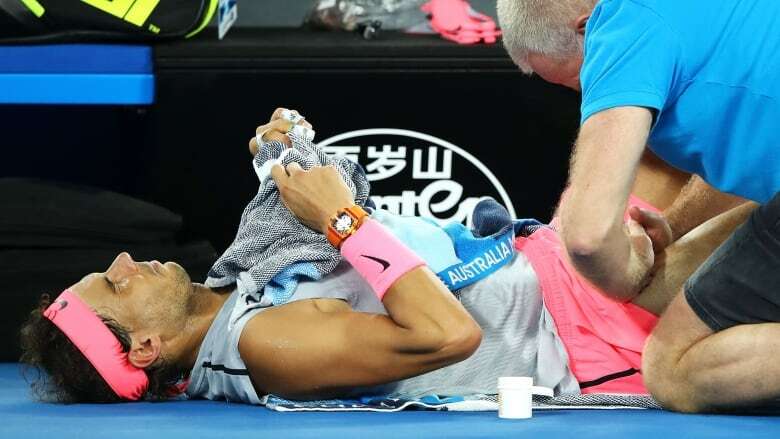 An injured and visibly struggling Rafael Nadal retired while trailing in the fifth set of his Australian Open quarter-final match against Marin Cilic on Tuesday. The top-ranked Nadal saved five break points in the last game before Cilic broke his serve, then went to shake hands with the umpire and his opponent. The No. 6-seeded Cilic advanced with a score of 3-6, 6-3, 6-7 (5), 6-2, 2-0, retired . Cilic will play a semifinal against No. 49-ranked Kyle Edmund, who earlier beat Grigor Dimitrov in four sets. It was only the second time Nadal had retired during a Grand Slam match — the last time was also an Australian Open quarter-final, in 2010 against Andy Murray. On Tuesday night, he needed a medical timeout after going down 4-1 in the fourth set, getting treatment on his upper right leg and hip. He returned but was clearly bothered by the injury, limping and trying to stretch between points. Nadal had a delayed start to the season because of an injured right knee, but appeared to be in good form through the first four rounds. Now the 16-time major winner hasn't won back-to-back Australian Open quarter-finals since 2008 and `09, the year he won his only title at Melbourne Park. His absence also means there's only one of last year's finalists remaining in the tournament. Roger Federer, who beat Nadal in five sets last year, is playing Tomas Berdych in a quarter-final on Wednesday. There'll be a British man in the Australian Open semifinals for the seventh time in nine years. It'll be Kyle Edmund this time, though, not Andy Murray. Edmund upset No. 3-ranked Grigor Dimitrov 6-4, 3-6, 6-3, 6-4 on Tuesday to reach a Grand Slam semifinal for the first time. 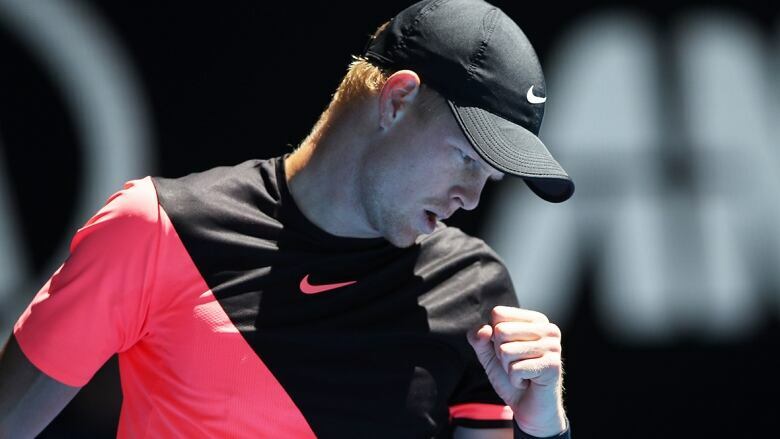 Edmund had never played in a major quarter-final, had never won five consecutive matches at tour level, had lost both of his previous matches against Dimitrov and had never beaten a top five player. "I just held my nerve in that last game and prayed that last ball would be out," Edmund said. It was out. And so was Dimitrov, who lost a five-set semifinal here last year to Nadal and had only just beaten Edmund two weeks ago at the Brisbane International. "When you're on these types of stages, reaching the last stages of the best tournaments in the world, it's very pleasing. But of course I want to keep going," Edmund said. Dimitrov, who won the season-ending ATP Finals last November, was coming off back-to-back wins over No. 30 Andrey Rublev and Nick Kyrgios, who was the last Aussie still in contention in the tournament. "There's no point for me to say what I did wrong — it's all about him right now," Dimitrov said, referring to Edmund. "Everything went his way today. It's hard to hide a disappointment. It hurts, and so it should." Canada's Gabriela Dabrowski and her women's doubles teammate Xu Yifan of China were eliminated in the quarter-finals of their tournament. Dabrowski and Xu fell 0-6, 6-1, 7-6 (2) to Russia's Ekaterina Makarova and Elena Vesnina. The Canadian, though, did advance in mixed doubles, winning her round of 16 match with Croatian teammate Mate Pavic in straight sets. Mertens is the centre of attention in Belgium after reaching the semifinals in her debut at the Australian Open. Mertens, who trains at Clijsters's academy, added: "Kim, thanks for watching. "I'm trying to be in your footsteps this week." 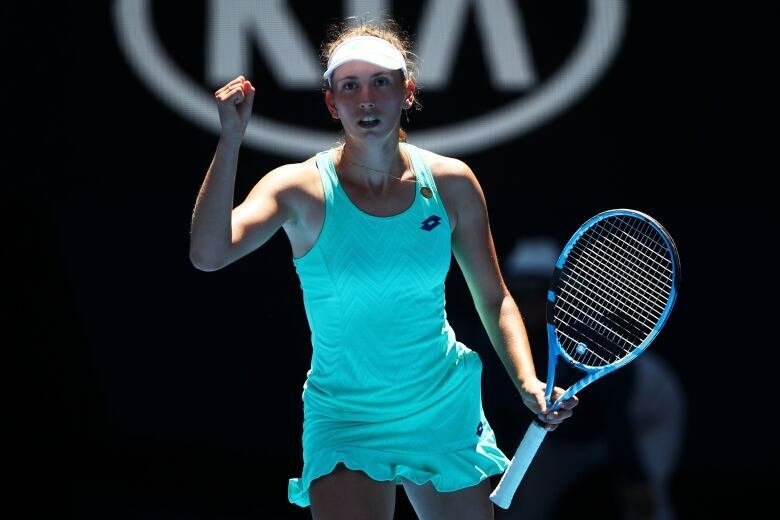 Coming off a successful title defence at the Hobart International, Mertens dominated against Svitolina, who had also been on a nine-match winning roll after winning the Brisbane International. Svitolina had won their only previous tour-level match, but had no answers on Rod Laver Arena and later said hip trouble had been bothering her all year. The 22-year-old Mertens was one of the biggest movers on the women's tour in 2017, improving her year-end ranking from 120 to 35 and won her first career title.